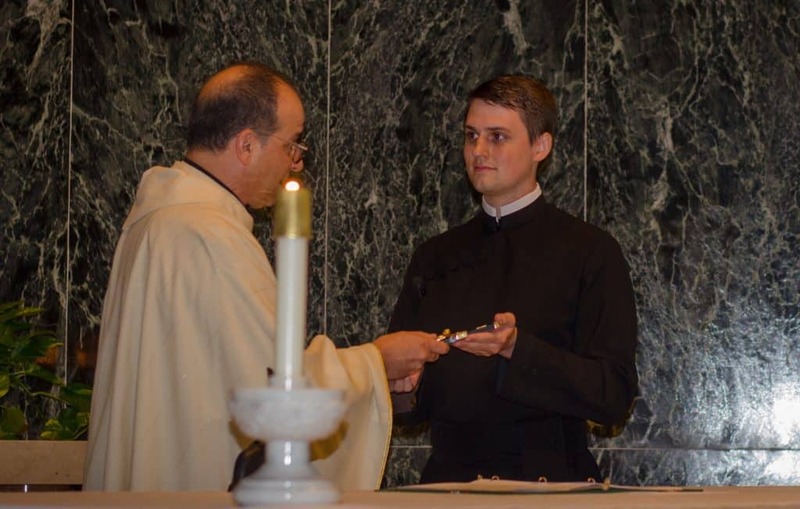 While many people celebrated Labor Day Weekend, the Paulist seminarians progressed in their particular labor of love – to prepare to serve God’s people through life and ministry with the Paulist Fathers. Bishop Roy Campbell, auxiliary bishop of the Archdiocese of Washington, D.C., ordained Evan and three other seminarians from other religious communities during a special Mass in the Crypt Church of the Basilica of the National Shrine of the Immaculate Conception in Washington, D.C.
At the end of his homily, the bishop asked Evan and the other ordinands to face their family and friends in the congregation and applaud them for their support. Evan smiled as he turned to his parents, Kit and Kevin Cummings; his brother, Ian; his Godmother and aunt, Elizabeth Sweeney, and her husband, Kevin; and Evan’s grandparents, Margaret and Bernard Kowalski. “We both feel really grateful that we’ve been able to be witnesses to this,” Kevin Cummings said later. 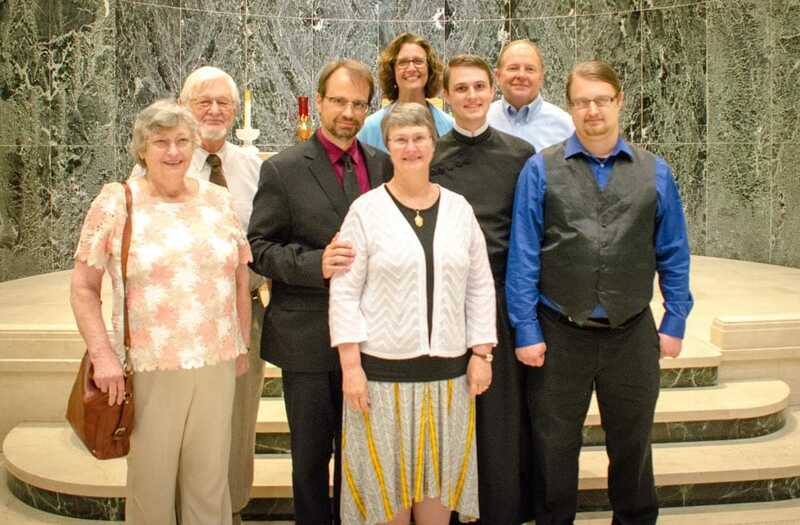 Kevin and Kit have been particularly supportive of the families of all seminarians. They started the blog seminarianparents.com to answer families’ questions about the seminary process. Special Paulist touches in the Ordination Mass included Sr. Sara Dwyer, A.S.C., reading a scripture passage from the prophet Jeremiah. Sr. Sara was part of the formation team that guided Evan. Paulist Fr. 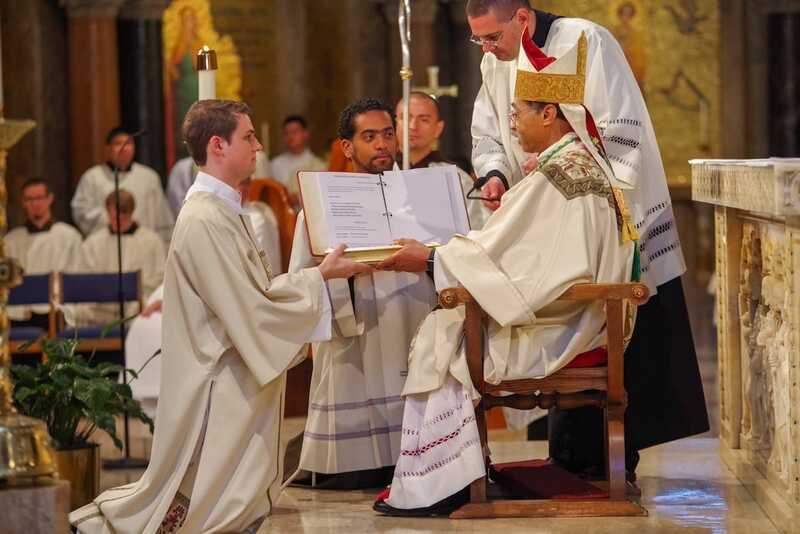 Dat Tran, the Paulists’ vocation director, said that a meaningful moment of the Mass for him was when each new deacon was handed the Book of the Gospels. The order of deacons is closely associated with proclaiming and preaching the Good News. “Believe what you read, teach what you believe, and practice what you teach,” the bishop proclaims. Paulist Fr. 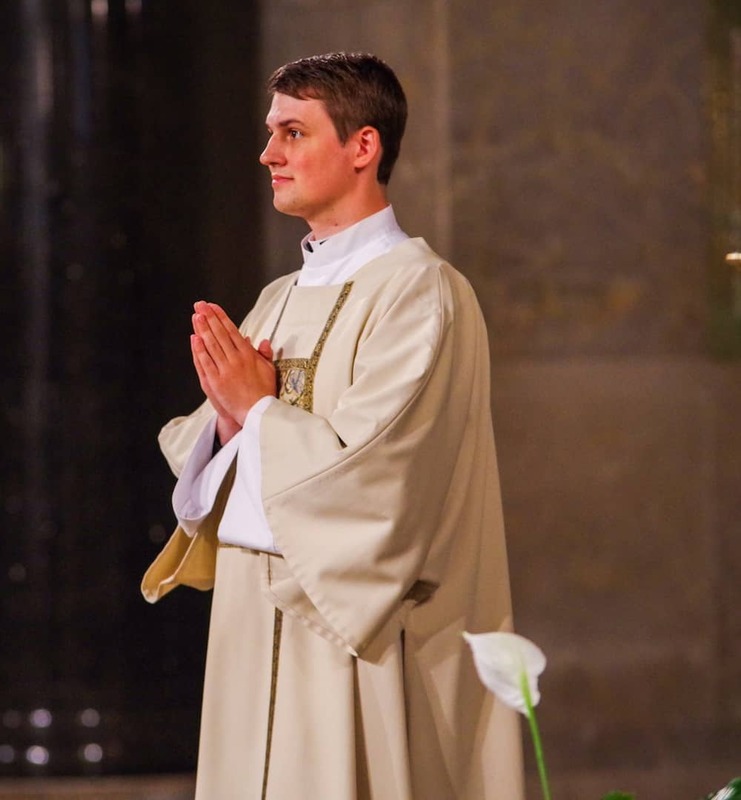 John Collins, a full-time Paulist missionary who was at the Ordination Mass, said he was impressed that Evan and the other men moved forward to be ordained during this difficult time for the Church. The day before the diaconate ordination, on Friday evening, August 31, Evan made his final promise to the Paulist community during a special Mass in the chapel of St. Joseph’s Seminary in Washington, D.C.
Paulist seminarians Michael Cruickshank, Paolo Puccini and Richard Whitney also renewed their promises. Fr. 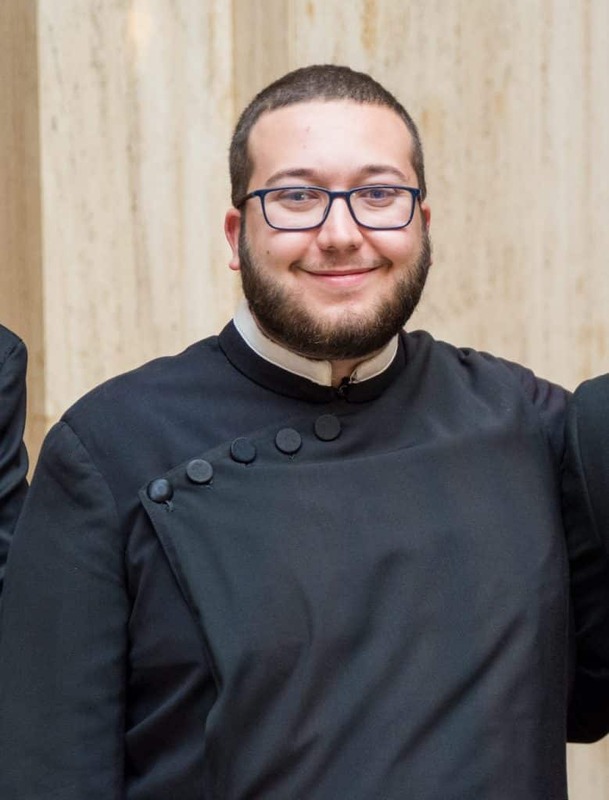 Eric shared quotes from recent reflections provided by the Paulist seminarians. “As long as there’s a hunger for God’s love, I’ll keep showing up,” another wrote. Fr. 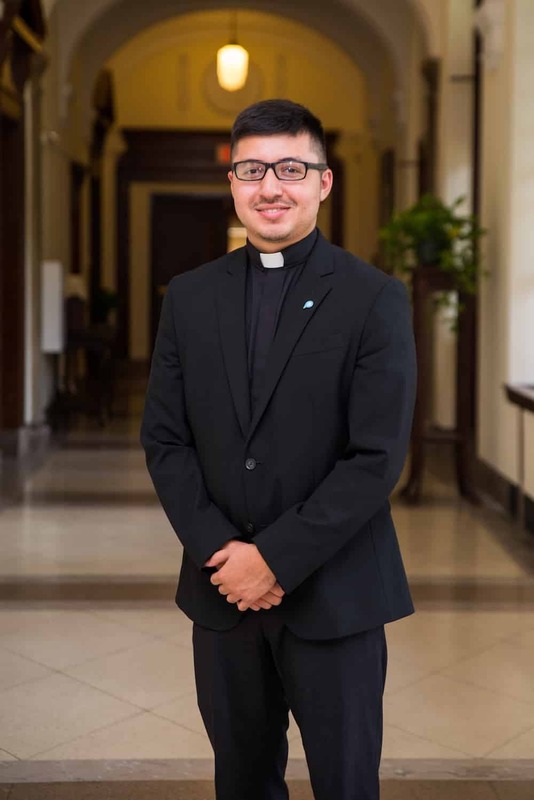 Eric said that the seminarians’ reflections helped his journey of faith in the wake of the abuse revelations. Jennifer Szweda Jordan is a writer and audio producer based in Pittsburgh. Please visit this SoundCloud playlist to hear Jennifer’s interviews with some of those who attended the Diaconate Ordination Mass on September 1 and the Promises Mass on August 31.